Now it has already been three years ago that ACIM became Vice World Champion 2015 at the World Championship of the United Dance Organization (UDO). With this first international success new doors opened for us which gave us opportunities to grow into the dance group that we are today. 2015 was the year when we wanted to try something new. In the years before we had competed in smaller championships on a national level and also several times in international events. But then in 2015 we heard about UDO and felt like trying our luck there. It all began with the West German Championship, where we qualified for the European Championship in Kalkar. The West German Championship brought a whole bunch of new impressions for the whole crew. We met and experienced crews, quads, duos, solos, and everybody around us was just dancing and having a good time. Every dancer was judged within one day. The atmosphere was full of energy and we couldn’t wait to go on stage. It was such a big success for us to get the qualification after this incredible day. The European Championship was the first time we had to stay together for more than one night, so we were all very excited. But in the end it was amazing for us to spend a whole three days with each other, to have late night talks and rehearsals right before going to bed. First we had to think about how to get there: the annual World Cup tradtionally takes place in Scotland. To search for affordable flights and accommodation for nearly 20 people seemed a rather inhuman task, but we knew for sure: We want that! And whatever it takes, we would be at there. Is our dream coming to an abrupt end? The disillusionment, however, followed quickly: after we had calculated everything, we knew: we just could not afford to go to the World Cup. At that time, most of our dancers were still students and simply unable to afford several hundreds of euros. To realize this was very painful for us. We had fought and trained so much to get to that point and now that our dream was almost becoming reality, everything should come to an end? No! We could not and did not want to accept that. So we worked out a plan to get the money together. In the weekends we danced in the streets of Mainz and Wiesbaden to collect some money. Many of us took over jobs like cleaning and housekeeping, and by and by we got some money together. We were very proud of us and continued our efforts, but soon realized that it was far from being enough. But still, giving up was no option! We were willing to do everything for this moment on the big stage. So we finally came up with the idea to try some fundraising. Hopefully someone out there would help us to realize our dream. Through the newspaper in Mainz our call spread quickly. We were totally amazed: there were actually people who became aware of us and wanted to donate for our dream. We had all reason to be thankful for all the support and encouragement. The time went by very fast: the summer training camp, where we trained every day, just flew by. August came and then the day of our flight to Glasgow for the World Cup was finally there! We still could not believe that we would leave Germany to dance with the best dancers in the world. For a few of us it was the first time ever that they were in an airplane, so the excitement on the day of departure was high. Waiting at the terminal with 20 dancers dressed up and practicing their formations attracted quite a bit of attention, which soon made us a topic at the airport. ACIM arrived in Scotland and we went straight to the event and could’nt trust our eyes. The event took place in huge halls larger than anything we had seen before. From everywhere came music, crowds and hundreds of dance groups romped here and there. Once found in the hustle and bustle, it already got serious for us on Friday: the preliminary round began. We all still remember our beating heart when we took the first steps on the big stage. And then the music began. That’s when we finally realized that all of this was not a dream. We really stood there and were allowed to participate in this huge event, to be part of something so big and beautiful. After our appearance we had to wait a couple of hours for the judgement: how did the jury like our dance? What were our chances compared to the other groups? Would we come straight to the final on Sunday or would we have to fight for it again on Saturday? We came straight to the final! So we did not have to dance the second preliminary round on Saturday. That a shock: the joy of such a response was enormous. We have never expected to reach the final directly. After we realized that, we quickly became serious again. Because it was not over, on the contrary: it had just started! Quickly we drove back to our accommodation and fell into an exhausted sleep. Rested we went after breakfast on Saturday directly to work: we spent the whole day with training and gave the final details a fine touch. Saturday passed as fast as the other days and we spent the evening together. The whole group chatted again about the show and we exchanged our thoughts. The focus was clear for everyone: we will rock that thing tomorrow! On Sunday the big finale of the World Cup 2015 took place. There were only a few hours left until our appearance. Carefully we did a warm up and stretched extensively. We had done everything in our power for a good preparation – now it was time to show it on stage. A few dance groups had to perform before us, so the excitement grew bigger and bigger. With our ritual silence minute before the performance we concentrated completely on the upcoming show. “Give a warm applause for ACIM.”, These were the words of the MC, so now our turn has come. On the stage, we danced with all our soul, each giving every little bit of energy out of his body and trying to get the most out of every step. We all were able to feel the unity we had become through the common hard work in the past few months. We will never forget this performance in our whole life. After the appearance we hugged each other with relief. All the tension of the last time fell away from us: to bring a good performance on stage, with which we and, hopefully everyone who had supported us, was satisfied. Our dream of being present at the World Cup was already fulfilled. Now we had to be patient. So we waited and looked at the many other dance groups. Finally all crews had to go behind the stage! Tight together in a circle, we stood with the other groups in the backstage area, and listened the words of the MC. He begun and called out the 7th place, the 6th place and so on. We could hardly breath when the third place was called and our name was still not fallen. What happened? Have we perhaps slipped to the 8th or 9th place? Or was there a mistake and we were forgotten? And then we finally heard our name. It was hard to believe. We made the 2nd place! Everyone was so emotional and we ran while hugging each other and all in tears on the stage. ACIM is Vice World Champion 2015! Everyone was crying with joy and the judges handed us our oversized trophy on stage. This moment was truly the best we have ever experienced together. All the effort we put into this event paid finally off. Of course, our coach was the first one each of us wanted to thank because only through her creative and hard work we had the chance to take this success home. Slowly a huge circle of ACIM-dancers formed, everybody wanted to hug Ece and did not want to let her go anymore. Vice World Champion?! We have to celebrate that. At a fancy meal we celebrated our victory properly and there was even a glass of champagne for the adults. Only gradually did we realize that we would fly home as Vice World Champions tomorrow. A long journey beginning with the West German Championship and leading us to Glasgow was over. But in the end, that was just the beginning. 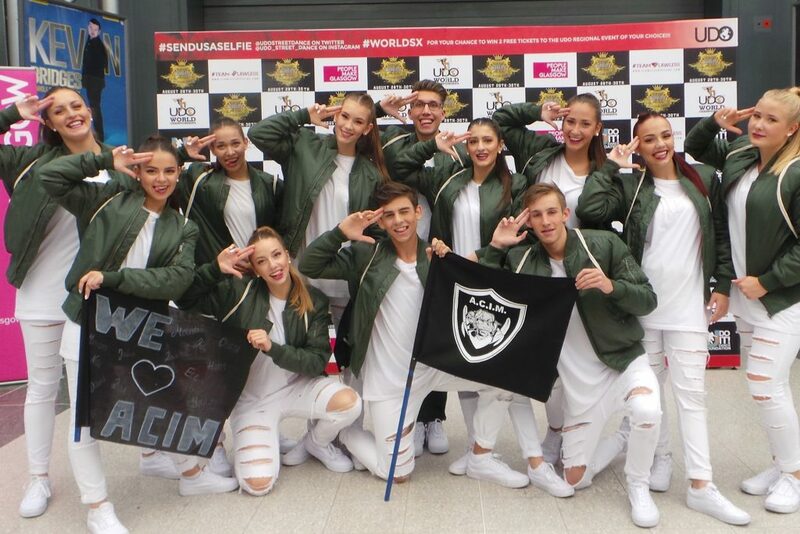 Since the World Cup 2015 we have grown as a dance group. Together and individually, we have evolved a lot, thanks to this experience we have been able to achieve some national and international successes and to level our performance up every year. We are grateful to everyone who supported us in 2015 and still cannot believe the level of popularity from then until today. This experience was a fundamental event for ACIM and we will probably still be telling this story to our grandchildren. THANK YOU!